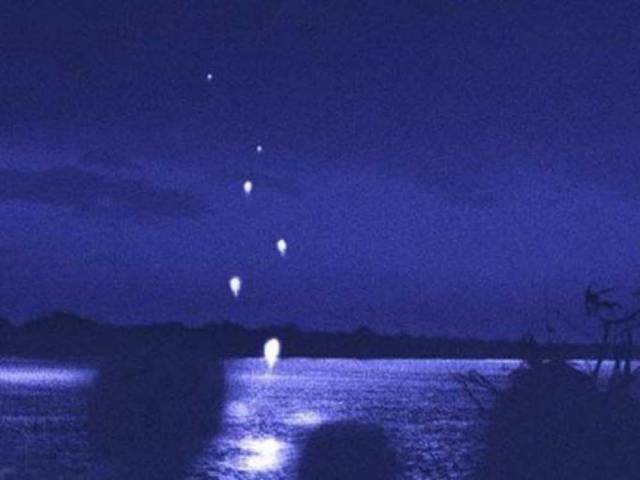 More specifically referred to as Naga Fireballs, these lights are seen along the Mekong River in Laos and Thailand. They are basketball-sized red fireballs seem to rise silently up from the water, shooting into the air about 100 meters and vanishing. They seem to occur every year around late October and range from thirty to as many as a few thousand! They are revered in Thailand as part of the Buddhist Lenten season. Every year, Wan Ok Phansa, the final day of the season celebration, huge groups of people line up the bank of the river to watch in hopes of seeing the fireballs rise up from the water. The celebration commemorates the return of Buddha in Naga form, and it is widely believed by some Buddhists that the fireballs are actually the breath of the Naga, a giant sea serpent that awakes every year in honor of the Buddhist Lent. Photos such as these have been taken for years and scientists have many theories on what they depict, but no definitive proof. Some researchers claim it must be phosphine gas being released from the river bottom, others say it is methane. But either of those would require highly specific environmental conditions and precise concentrations to produce the fireballs. Many scientists just don’t believe that type of precision could be counted on to occur every year in October, at the same place, year after year. There are British reports of the fireballs from the 1960s, and supposedly there are writings in Buddhist temples of the lights occurring long ago. In recent times, the lights have resulted in a boost in tourism as they are fun to watch; even though no one really knows just what it is they are seeing. This photo was taken in the 1950s. The story goes that the Cooper family took this photo shortly after moving into an old house they bought in Texas. They were excited in being in a new home and wanted to celebrate the occasion. 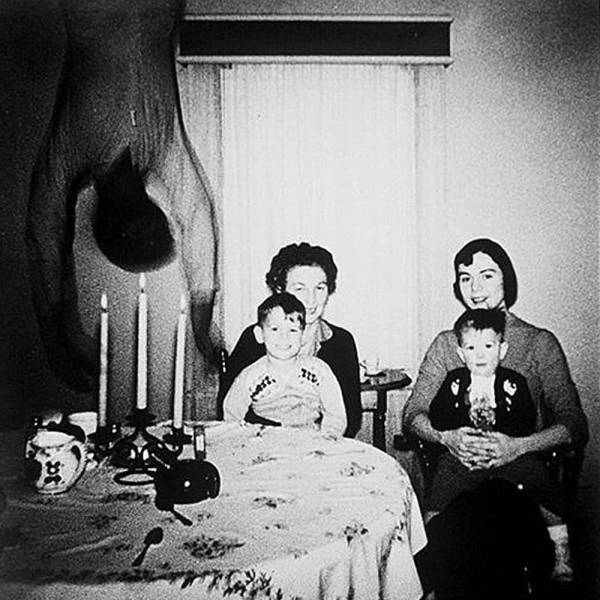 When they got the photograph developed, they were horrified to see an image of a body falling from the ceiling. They assured people that there was indeed no falling body while they were having the photo taken. Tons of experts over the years investigated, yet no one could give a explanation for the occurrence. Some claim it must be a problem with the photo developing, others say it must be some sort of hoax. Some say it is proof of a haunting and must be one of the house’s previous tenants who died. Of course, some others are insistent that someone actually did hang from the ceiling while the photo was taken; it’s that simple. But then, if that’s the case, why are their face and hands blacked out? Crazy as it is to look at, this picture grew famous as it stands out as a peculiar piece of evidence that just can’t be reconciled. 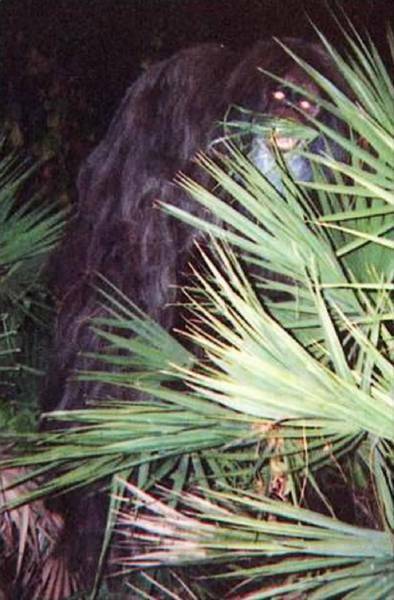 The Skunk Ape is the name given to a cryptid similar to a Sasquatch except local to the American southeast. Sightings of this beast date back to the mid-1800s in Arkansas when mountain men in the Ozarks reported witnessing them. Reports of the period say the creature is gigantic in stature, hairy, with an incredible stride able to quickly flee when sighted. Footprints found measure an incredible 14 inches long. Then, in 1974, the old myth was brought into the present when multiple sighting occurred in suburban Dade County in Florida. Witnesses described a large, ape-like creature walking on two legs. Its eyes glowed and it had a stench on it that induced nausea to anyone downwind. Plenty of photos have been presented over the years and most easily explained away as misidentifications or outright hoaxes. Then, in 2000, an anonymous woman in Florida mailed two photographs to the Sarasota County Sheriff’s Department. The photographs were accompanied by a letter from the woman where she reported that there was an ape loose in the area. She wrote that on three different nights, this ape crept into her backyard and took apples that she had left on her back porch. One of those nights she photographed it before it hurried out of the area. The woman didn’t know anything about a Skunk Ape, but was convinced it was a huge, escaped orangutan. The photo above is a close-up of one of the photos. What do you think? Experts are unsure but are for certain that whatever it is, it was really in her backyard! 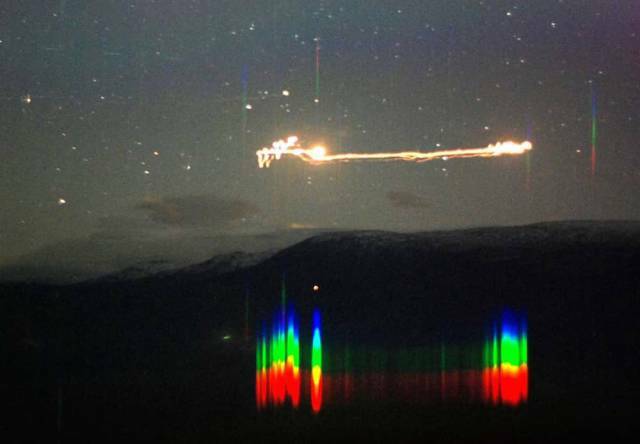 These lights are unexplained and have been seen in the Hessdalen valley over the city of Holtålen in Sør-Trøndelag county, in Norway. The Hessdalen lights usually appear as bright white or yellow and remain static or floating just above ground level. They sometimes remain in view for over an hour. They are just one kind of unexplained light that has been observed in that particular valley. These types of lights have been reported there since before the 1940s. The lights appeared quite often from between December 1981 until the summer of 1984, when they lights were witnessed sometimes 15-20 times a week. The appearance of the lights caused an increase in tourism with visitors staying overnight to catch a glimpse of the weird light show. After 1984, the light activity decreased and might be seen between 10-20 times a year. Scientists have some possible theories but nothing concrete. Some researchers think a possible explanation might involve some sort of plasma that lights up when it ionizes to form a cloud of ions and electrons, but it is all conjecture at this point. After all these years, they still really just don’t know. This is another down-home spooky light story. In fact, the lights are called the Spook Lights, or the Hornet Spook Lights, after the name of the town nearby where the lights keep appearing. 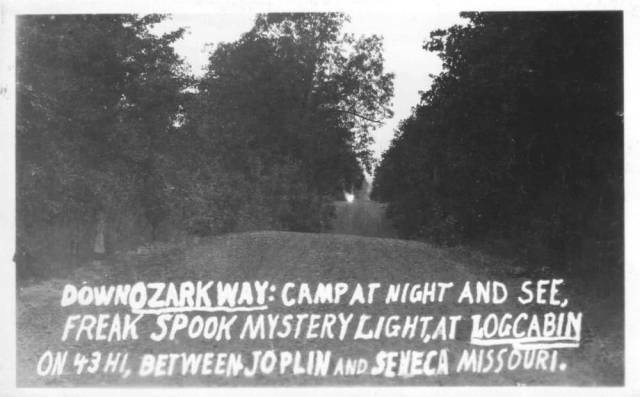 Since around 1866, these unexplainable lights have been witnessed in a small area referred to as the “Devil’s Promenade,” a four-mile stretch of country road on the border between southwestern Missouri and northeastern Oklahoma, just west of the town of Hornet, Missouri. According to witnesses, these little balls of fire vary in size to that of a baseball up to as big as a basketball. They dance and spin around down the center of the roadway at high velocity, rise and then hover above treetops, then suddenly just take off and vanish into the night. Sometimes they have even manifested inside of cars driving down the roadway, much to the dismay of the drivers. The lights never allow anyone to get too close to them and always retreat and disappear when someone tries. No one has been hurt by one, though many have been thoroughly frightened. Some have even taken shots at the lights with shotguns and rifles, with no effect of course. Throughout the years, many investigators, from paranormal to mainstream scientific, have tried to unravel the mystery of these Spook Lights, but none have been able to provide a conclusive explanation. The U.S. Army Corps of Engineers even came in once to take a crack at figuring the mystery out – they came up empty as well! This fascinating photo is one of the most widely known ghost pictures ever taken. Shot in 1919, the photo came to public attention in 1975 when it was first published by retired Royal Air Force Air Marshal Sir Victor Goddard. The photograph is a group portrait of Goddard’s squadron, which saw action in World War I as part of the Royal Navy at the HMS Daedalus training facility. In the photo, you can see the face of another man peeking out from behind the head of another pilot. 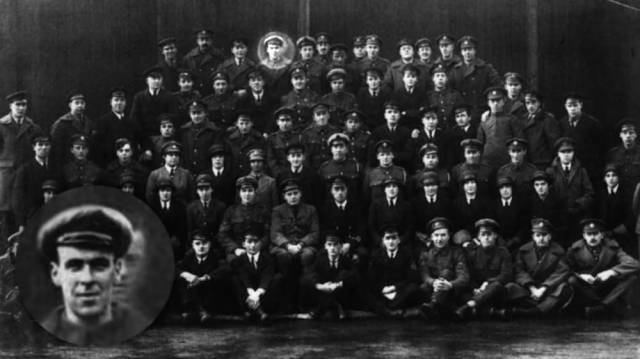 This extra ghostly face appears behind the airman positioned on the top row, fourth from the left. When members of the squadron reportedly first saw the photograph, they instantly recognized the face as belonging to a squadron air mechanic named Freddy Jackson. Sadly, Freddy had died accidentally just two days prior to the photo being taken when he inadvertently walked into an airplane propeller. In fact, the photograph was snapped on the occasion of Freddy’s funeral! Many believe that young Freddy, just not ready to accept his death, decided to show up and join his mates for the group photo. Some skeptics say it is a simple case of double exposure; however, the face is not wearing a military cap, as all the other airmen are wearing. Experts can find no evidence of tampering. Maybe it is just the spirit of Freddy Jackson having wanted to see the boys one last time. The Falcon Lake Incident is a reported unidentified flying object (UFO) encounter that occurred near Falcon Lake, Manitoba, in Canada. On May 20, 1967, Stefan Michalak was on vacation and doing some prospecting for quartz near the lake. All of a sudden, he spotted two glowing objects hovering in front of him. One took off and left the area, the other descended and landed approximately 150 feet from him. The craft was silvery in color, brilliantly lit, and approximately 35 feet in diameter. He described “colorful glass” around where the object landed and he attempted to touch some of it, burning his hand. 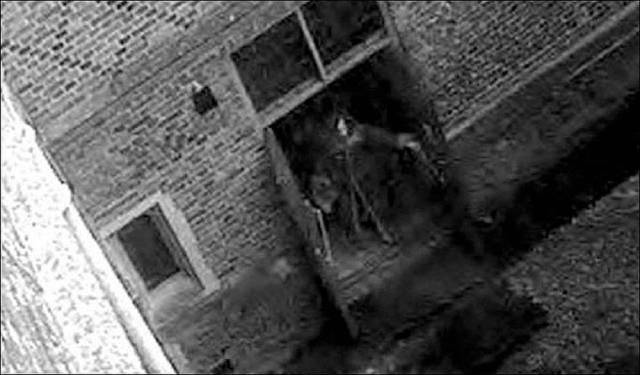 He reported that he saw some type of door open on the object and could hear “voices” emanating from inside. He tried to make contact in English and then in another language, but received no response. Then the object closed up and suddenly lifted off, leaving the area. The craft had a grid exhaust vent that blasted some type of hot gas as it lifted off and this exhaust struck Michalak in the chest, knocking him flat on his back, setting his shirt and undershirt on fire. 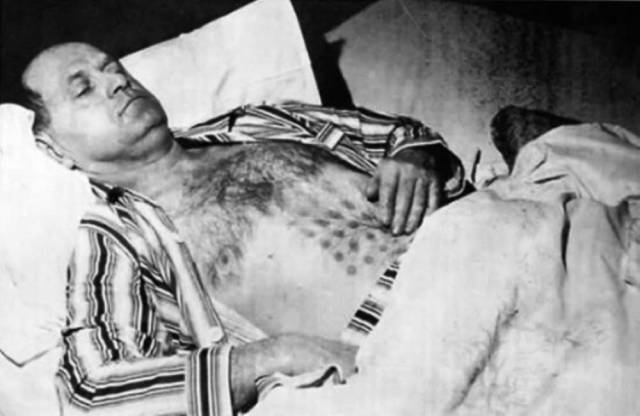 It was severely painful and left burn marks on his chest in the shape of the grid. In the days that followed, Michalak grew sick and in the next few weeks, he suffered from severe headaches, nausea, blackouts, diarrhea, and unexplained weight loss. These are all symptoms of radiation burns. However, doctors were unable to find anything wrong which would cause the symptoms. They were also unable to give a rational reason for the grid-like burns on his chest, other that Michalak’s own explanation. One of the most famous was captured on a security camera and has been dubbed “Skeletor.” It was winter of 2003, a fire alarm sounded in the palace near an exhibition hall, which signaled that the fire doors had been opened. When the security guards arrived, the doors were closed and no one was around. When they went back to review the security footage what they saw was astonishing. The doors seeming fly open without anyone nearby, then a darkly hooded “person” appears from the hall and draws the doors closed. Security recalled that those same doors had been opened at the same time, in the same way, the previous night, though they saw no ghostly figure on that night’s security footage. Many ask why these ghosts appear in black, as most ghostly sightings are white or cloudy. Well, 16th century dead are buried in white shrouds, hence white ghosts perhaps? However, if ghosts are a manifestation of a deceased one’s essence then Victorian-era ghosts would appear black or grey. This is because a Victorian would associate death with the darker colors of mourning, hence the appearance of the “Grey Ladies.” If ghosts exist that is…. On May 23, 1964, Jim Templeton, a firefighter from Carlisle, Cumberland, in England, took his wife, Annie, and his daughters, Elizabeth and Francis, to Burgh Marsh, a beautiful area on the Solway Coast. Jim, being an amateur photographer, wanted to take some photos, specifically of Elizabeth’s new dress, with his Kodak SLR. One of the resulting photographs was destined to become one of the most incredible photo mysteries of all time. 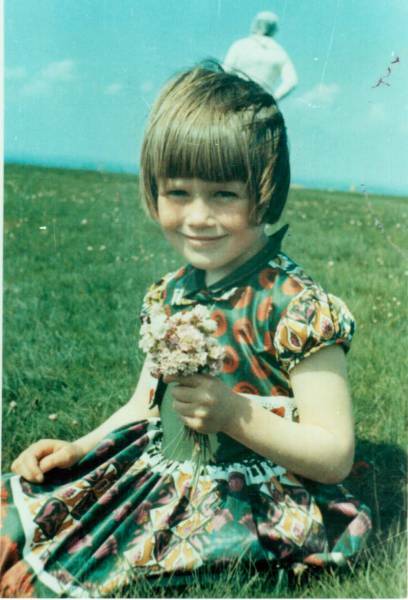 Jim took three photographs of his five-year-old daughter without incident. He sent them off to Kodak for processing and was shocked when he received them back. The middle photo had a strangely dressed person in the background. He insists that no one was in the background when he snapped the photo. In fact, he is sure his family were the only ones out there that day save for two old ladies sitting in a car on the road knitting. The strange person also wasn’t in any of the other two photographs. His wife and other daughter were standing behind him leaving only young Elizabeth in the shot. Jim sent the photo to the Carlisle Police who then sent it on to Penrith, Cumbria, where photographic experts could study it. Finally, Kodak inspected it and the camera looking for any defects. They also inspected the negative, looking for signs of overexposure, bad film stock or possible tampering. Kodak, like the other experts, found nothing wrong. Kodak then offered a reward of free film for a year to anyone that could adequately solve the mystery. The reward went unclaimed. It’s hard to believe but these two old photos are among the most famous UFO photographs ever taken. It was May 11, 1950, Paul and Evelyn Trent were on their farm about nine miles from McMinnville, Oregon. Evelyn saw it first, something strange flying in the sky. She got Paul, who grabbed his camera, and took two photographs of the flying object. A local newspaper first published them but then Life magazine heard about it and featured them in their June 26, 1950 edition. The Trents eventually passed away but their photos have continued to intrigue ever since. Ever since they were first published, photo experts have analyzed the photos and negatives and they have all come to the same conclusion: The photos really depict a solid object in the sky. Is it an alien spaceship, secret military project, a plate thrown in the air? They don’t know, but whatever it is, it is in those photos. There is still so much that is unknown about conditions under which the photos were taken, such as the weather or camera settings. Experts only had the negative and the photo to go by. When I was a child and saw the photos, they screamed hoax to me. But then I saw an in-depth examination on television where all my amateur theories of how it was done were all debunked. I thought I was smart – my little ideas had been thought of and checked many years before I came along. So what did the Trents see in the sky that morning? No one really knows. Is it really a hoax? No one can say for sure, but for the past 60 years the photographs have been ruled authentic. 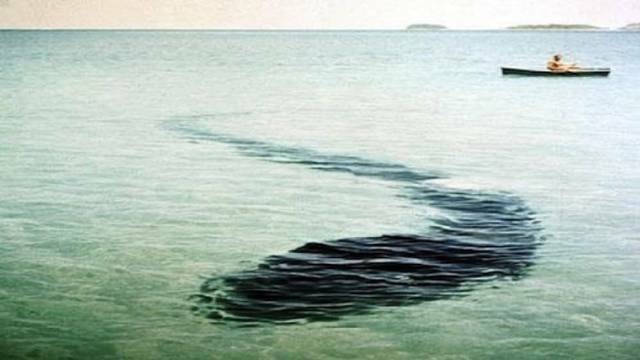 The photo has been circulating for years and I always thought it was just a tadpole that was Photoshopped into some huge creature. Then, I learned the photo, one of about three that were taken, has been around for decades, way before photo editing was possible. It all started in 1964, when Robert Le Serrec and his family bought a boat and decided to holiday for a few months on Hook Island in Stonehaven Bay, Queensland, Australia. On December 12, the family was boating across the bay when Le Serrec’s wife spotted a strange object on the bay floor. Le Serrec began taking photos of what appeared to a large snake-like creature resting on the sea bottom. They estimated it to be about 30 feet in length. They slowly moved closer and Le Serrec decided to get in the water to see what it was (too brave for my taste!). Underwater, he realized it was much larger than first estimated. It didn’t move when approached. He thought whatever it is, it must be dead. Just as Le Serrec got closer, the creature opened its mouth and began moving. Frightened, he quickly made his way back to the boat. By the time he got on board, the creature was gone. The pictures were initially published in Australia’s Everyone magazine and have since been widely distributed. The other photos depict what appear to be eyes located on the top of the head, and what could possibly be a wound on the right side of its tail. The creature was described as black in color, with some brown striping and smooth skin. Le Serrec saw no teeth inside its wide mouth. No real explanation, however, has ever been found for whatever was photographed that day. Hardy admitted that he had heard about the rumors of the house being haunted. 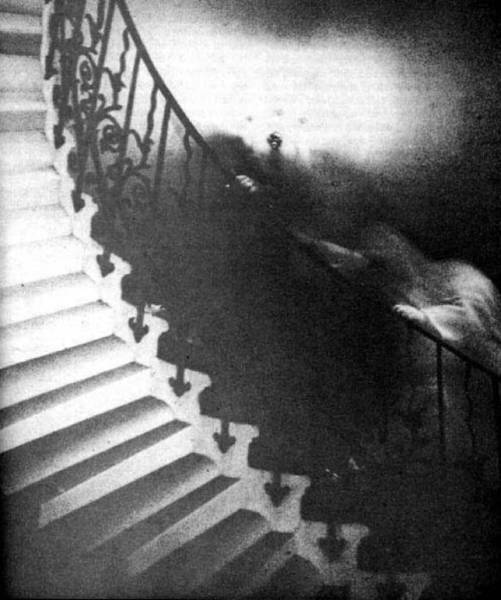 Spectral apparitions and unexplained footsteps are always being reported near the staircase by both visitors as well as staff. There have been sightings of a ghostly woman seen wiping down the bottom of the stairway. She is believed to be the ghost of a maid who fell over the banister and died at the foot of the stairs hundreds of years ago. Experts from all over, including Kodak, have examined the photo and the original negative. They concluded that the photo had not been doctored. It remains unexplained. This photo was published in the Los Angeles Times on February 26, 1942, and has been mentioned as definitive proof of extraterrestrial visitations. The photo clearly shows searchlights focused in on… something. It all began in the early morning hours of February 25, 1942; just three months after the Japanese attacked Pearl Harbor. The U.S. had just entered World War II and the military was on high alert when it responded to what was believed to be another unprovoked attack above the skies of California. Witnesses reported a large, round object, glowing pale orange, in the skies above Culver City and Santa Monica, cruising along the Pacific coast. 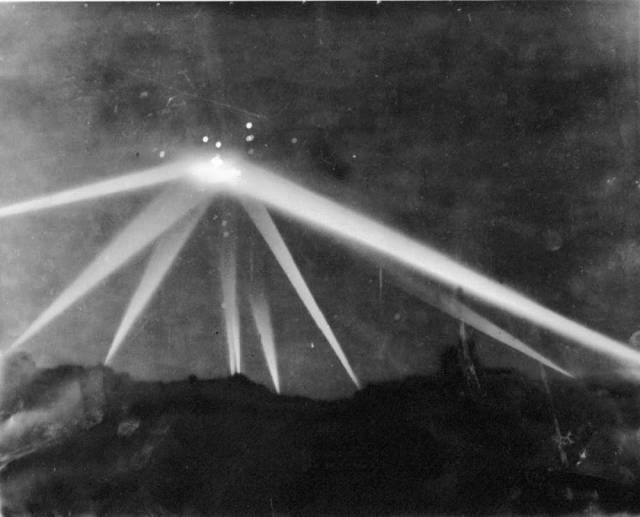 Air raid sirens sounded and searchlights began scouring the skies over Los Angeles, as over 1,400 shells from anti-aircraft guns barraged the mysterious object as it quietly moved across the night sky, vanishing from view. No enemy aircraft were shot down and indeed no satisfactory explanation could be given for what occurred. The Army’s official statement was that “unidentified planes” had invaded Southern California air space, but Secretary of the Navy Frank Knox dismissed those claims as “war nerves” and a “false alarm.” They never could explain the bright lights in the sky that started the whole affair. The Phoenix Lights were one of the largest mass UFO sightings ever reported. 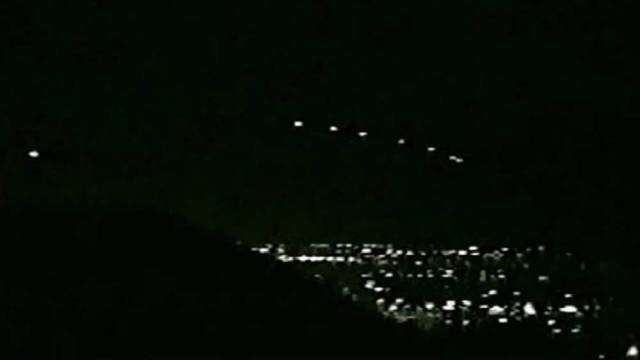 On March 13, 1997, these lights were seen by thousands of people in the skies above Phoenix, Arizona. The sighting was actually two sightings. The first at about 7:30 PM, were a triangular formation of lights was seen to cross the city. The second sighting, at approximately 10:00 PM, is the one where hundreds of photos and videos recorded a series of stationary lights hovering over Phoenix. Thousands of witnesses reported the event to the local Air Force bases and news stations. Due to these reports, investigators were able to ascertain the path of the lights, coming from the northwest Nevada border in a southeastern direction over Phoenix and Tucson, into Mexico. This mysterious photo is one that was taken by astronauts during a U.S. space shuttle mission to the International Space Station in 1998. 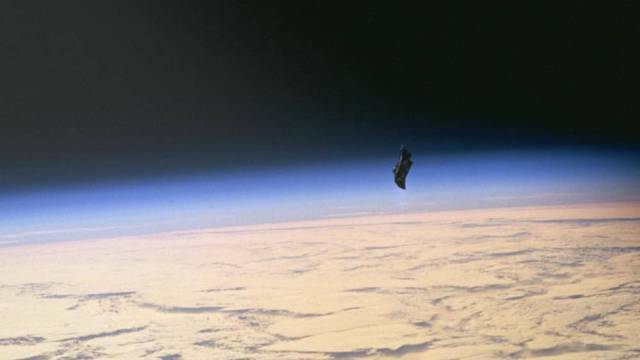 It is the mysterious orbiting object known as the Black Knight Satellite. It is in near-polar orbit above the Earth and many believe it is thousands of years old and of extraterrestrial origin. Supposedly Nikola Tesla picked up repeating radio signals off of it in 1899. Though amateur radio operators and astronomers worldwide have been reporting strange radio signals emanating from the satellite since the 1930s, information about the Black Knight didn’t come to light until 1954 when numerous newspapers, including the St. Louis Post Dispatch and the San Francisco Examiner, ran stories about it. Retired naval aviator and UFO researcher Don Keyhoe told the newspapers that the U.S. Air Force has known about the mysterious satellite orbiting the planet. Back then, in 1954, there were no man-made satellites (Sputnik wouldn’t be launched for another three years). The story soon became a major media interest. Both the United States and the Soviet Union became particularly interested in the satellite, each believing it might belong to the other. Other countries, such as Sweden, began to take interest too. In 1957, a Venezuelan government official photographed it while tracking Sputnik II as it passed over Caracas. He noted that as Sputnik, and other satellites, orbit west to east using Earth’s natural rotation to maintain orbit, the strange Black Knight orbits east to west. Whether it’s just space junk or an alien satellite, the Black Knight has been around for a long time. With numerous photographs, many still remain skeptical about what it is and where it came from. 2 responses to "Freaky And Spooky Photographs That Nobody Knows How To Explain (15 pics) "